Roasting marshmallows, telling ghost stories, spending time with friends and family, appreciating nature; these are all the wonderful things camping has to offer. In order to fully enjoy your trip, however, you have to choose the right tent. There is nothing to make your camping experience completely miserable than a leaky, inadequate tent. The three season tents are used for more general backpacking excursions. They are intended for Spring, Summer, and Fall use, as they will more than likely fail you if it snows heavily. However, it does hold up well in the rain. 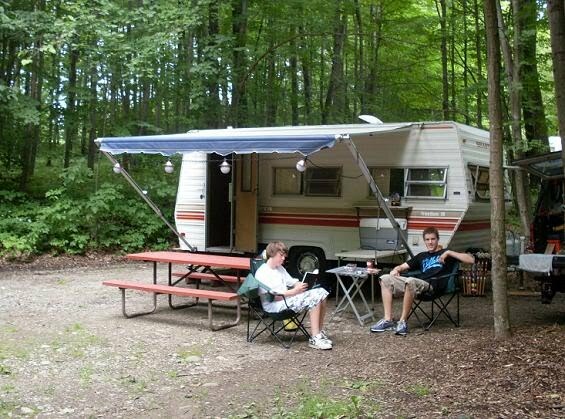 Most campers are accustomed to three-season camping, so there is a big selection to choose from. Keep in mind that the first section of three-season shelters mentioned are actually more for summer use. Under this category lies a couple of different versions. Both are very light in weight, but probably not what you are looking for in general camping circumstances. In fact, though they are classified as a tent, screen shelters are more of an area you would eat under and are not protected from the elements at all. In addition, tarps are usually very open to the outside. 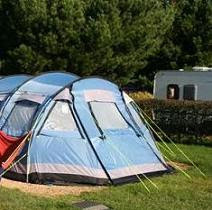 This type of tent should be used mainly for warm and humid climates, though it does work as a three-seasonal. They are extremely light weight due to its mesh walls. I would not highly recommend this model, however, because if it does rain or snow, you will freeze your tush off. If you are into bare-essential camping, single-wall tents are for you. They are basically rainflies equipped with a few vents you can zip open during warmer conditions. For more general camping however, this could lead to that miserable scene I mentioned earlier. These are minimalist shelters for one camper and not much else aside from a sleeping bag. In fact, it pretty much looks like a sleeping bag with a small tent covering your head. If saving weight is your chief priority, a bivy is worth considering. If you like room to move inside your shelter, look elsewhere. Though technically it is a three-season tent, I wouldn't try using it in the fall. I hate camping. I am the only person in my family who hates camping, so it is a lonely existence. I've been told that I am unreasonable, a poor sport and a wet blanket, so I have decided to state my case. You don't have AC or heat, depending on the season. You have a hard lumpy bed no matter how many rocks you chunk away from the sleeping bag portion of the tent, and someone invariably forgets their pillow, or dunks it in the creek while attempting to see if it will function as a flotation device, or inadvertently sets it on fire while trying to warm it up on the charcoal pit. Therefore as the mom I have to sacrifice my pillow and prop my neck on a rock. Which I have to re-fetch from where I chunked it two hours before. Which I have to explain to my husband why I am bringing said rock back INTO the tent, and wrapping it in a towel. Also, I am in charge of cooking, which blows. I don't personally feel that hot dogs and marshmallows and beer four times a day qualifies as a meal, but the limitations of a charcoal fire in a pit are kind of severe. Plus I don't think a cooler filled with water that used to be ice is going to keep food cold enough to ward off horrible food borne diseases, so perishables are out. Hubby and the kids eat hot dogs, roast marshmallows and drink beer all day (OK, OK, the kids drink ROOT beer) and I nibble on crackers and drink as little as possible so I don't have to brave the bushes to pee. I chase kids all day, lugging a assortment of first aid accoutrements, and sweating. At sundown I am exhausted, but of course the kids are on a sugar high due to the nineteen and a half s'mores they consumed and insist on running about in the dark screeching. By the time they fall asleep, I am too tired to even mind the rock pillow. Of course, this is when hubby starts snoring, since the outdoors gives him allergies. It is too hot or too cold, depending, and there are NOISES all around. Plus even if it is dead winter a lone mosquito survivor will find me and bite me multiple times. No one else will have even one bite. Ants also apparently found the missing half of s'more glued to the underside of my sleeping bag. On the drive home, kids are overtired and cranky, and hubby is unbearably jolly. "Wasn't that a blast?" he asks. "And such a cheap way to vacation!!" I don't answer. I am adding up the receipts for gas, first aid supplies, the tire that blew out and two cases of beer and realizing I could have had a whole weekend in a Holiday Inn and eaten out three times a day. I'm talking the one with the INDOOR pool. 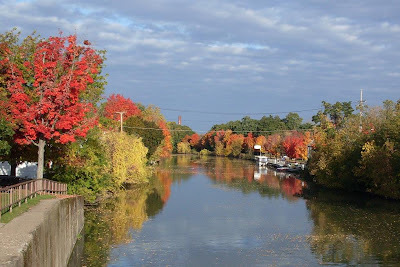 We've had a spectacular fall here in Upstate NY -- brilliant sunny days, crispy star-lit nights, and a smattering of rain. Our colorful array of oaks, maples, poplars, walnuts and birches have responded with everything from pale yellows to bloody reds. The leaves are falling fast and furious now that we've had a couple light frosts, so we'll soon have bare branches. These two paint-by-numbers scenes caught my eye along my regular route from Fairport to Victor, on Victor-Egypt Road. 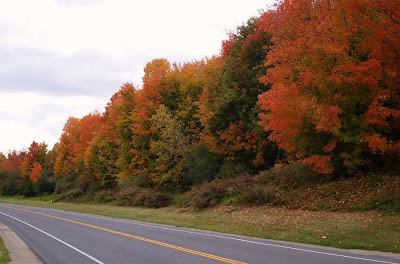 I'm sure a good arborist could explain why this particular stretch of highway boasts one of the most vibrant spectrums in the area. Natural beauty like this is all too fleeting to ignore. This road will serve up icy patches and snowdrifts very soon. For now, enjoy the view. Living in Belgium, my mom and dad had never seen an ostrich. They had seen such a bird on television, of course, but they had never seen a real live one. So, when they came to visit me in South Africa, I suggested a visit to a game park. The game park was some distance away, so we decided to make it a little camping trip. "Can I come too?" my 6 year old son asked. Of course he could. They were so excited and were so looking forward to their night out in the wild and seeing an ostrich up close and personal. "Have you been there before?" my mom asked. "Yes, I was there last year," I said. "Are the ostriches scared of us?" she wanted to know. "Or do they come up to the people?" "When I was there they didn't exactly come to the people," I said, "but they came nosing in the rubbish bins near the lunch tables." "Oh good," my mom clasped her hands together, "so when we stop for lunch we might get to meet them." "If they come close enough," I said. "You never know with these birds." The night before our trip to the game park, while my dad packed the car, my mom and I prepared a cold lunch for the four of us. Everything went into pots, and early in the morning we set off for our trip. We were hardly in the game park when my mom spotted an ostrich. "Oh look," she said, "there's one. I wonder if I can go take a look at him." "You stay right here," I told her. "Look, you do not have to go to him, he is coming to you." Nothing could have pleased her more. Lazily the ostrich walked up to the car, daintily placing one long leg in front of the other, moving his head up and down and side to side. Having arrived at the car he gave three short pecks at the side window where my mom was sitting. "Can I roll the window down?" she asked. Sure, why not. The window was hardly lowered when the ostrich's head appeared in the car, along with about 15 inches of his neck. He looked at each of us individually and we looked at him. Oh, he was a magnificent animal! Big and tall, with lots of black, grey and white fluffy feathers, and with long lashes over warm, dark eyes. At the allocated spot we set up the tent, made it comfortable, and by the time it was finished, it was time for lunch. We could have eaten at the tent, but mom was anxious to meet more ostriches, and so she suggested that we go and eat at the open air lunch patio. Her wish was my command. At the lunch patio numerous families had already gathered around the tables and under the umbrellas. All of them were barbecuing. When we started unpacking our cooler and placing the food on the table, we were looked at and whispered about. As we placed the potato salad, lettuce and tomato mixture and chicken pieces on the table people were shaking their heads and barely managed to hide their laughter. How rude, I thought. If they want to barbecue that is their good right, just as it is my right to eat something cold. We had no idea what the whispering and sniggering was all about, but we were about to find out. Six ostriches approached the patio. "Do you think they'll come as close as the rubbish bins?" my mom asked expectantly. Before I could answer the ostriches marched past the rubbish bins and headed toward our table. Before we knew what was happening, much less could do anything, the six surrounded our table and started pecking at our food. In a matter of seconds they had pecked the pots and plates clean. It was literally a case of peck, peck, peck, peck, peck and everything but everything was gone! 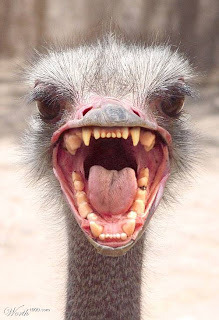 Whether it was potato in mayonnaise, lettuce in olive oil dressing, or fried chicken, the ostriches devoured it ALL! One even stole a rather large tomato out of the cooler and swallowed it whole. For a moment I thought he might choke on it, but we could see the tomato glide down his long throat. My dad had been very brave and had grabbed a basket of bread off the table, holding it high over his head away from the six hungry beasts. 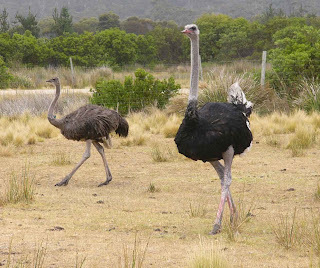 Little did he know that a seventh ostrich had joined the party and was standing right behind him. Peck, peck, peck and the bread was gone too. When all the food was gone, the ostriches walked away. Dazed, we looked at each other and the empty table. All around us people were holding their breath, waiting for our reaction. Would we get angry? Or, would we see the humor of it? The couple at the nearest table told us that barbecuing was the only way to eat in the park. The fire was the only thing that kept the ostriches at bay. We, with our cold food, had just about sent them an engraved invitation. We nodded, wordlessly. There we were, robbed and hungry, and the next moment howling with laughter. Reprinted by permission from Conny Manero, all rights reserved 2008. How about you? Do you have a True Camping Story you'd like to share? These will be a regular feature here as we move forward. If you'd like to submit your story for posting, you can reach me via Comments or by using the link at the top of this page. One of the most common problems in the English language is the use of contractions. They are supposed to make life a little easier, but it seems that they don’t do much more than confuse. The case of your vs. you’re is a classic example. I have said that the easiest way for me to remember the difference between two similar words is to focus on the meaning and use of one. If it’s not the one, then it must be the other. I’ll give you the meaning and use of both, and try to emphasize one to help you remember. “Your” is possessive. When I use the word, I’m talking about something that belongs to you, or an attribute of you. Example: Your cat is a beautiful calico. Wondering how this article relates to Camping? Well, for me, I do all my best writing early in the morning while I'm sitting under my camper's awning watching the sun come up and drinking the day's first cup of coffee. And yes, it's also the best time to makes lots of typo's. What's your best time and place for letting the creative juices flow? Sunshine and 80 degrees on a mid-October Sunday means a day for hiking in the woods, and so we did. 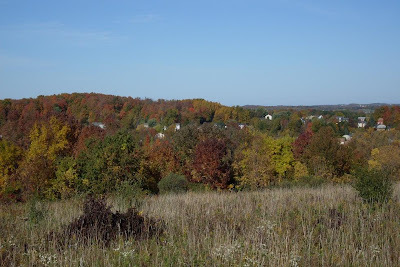 The Town of Perinton's Crescent Trail presents a moderate short-hike challenge and a couple of spectacular hilltop views. We forgot to grab a map from the town rec center, and so had to climb first to the top of the first hill (very steep) to snap a picture of the one posted there. 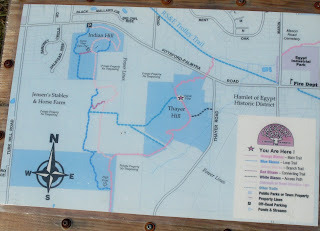 Once we had our bearings we set out deeper into the woods to seek the Scenic View marked for the summit of Thayer Hill. We continued our hike by following the blue-blaze trail, which starts out mostly level and meanders along near a small creekbed. 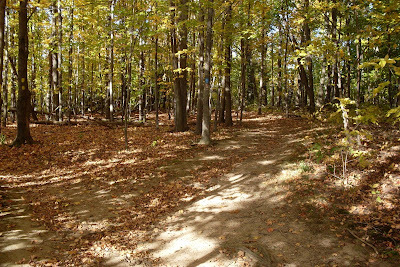 While the sun was hot outside the treeline, in the woods we enjoyed a comfortable, shaded path. Eventually the trail left the woods and we found ourselves at the edge of a field. 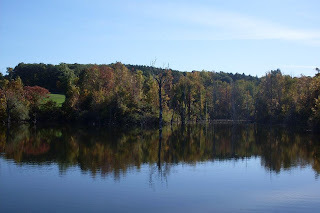 We couldn't find any more blue blazes, but we did find a beautiful, secluded pond. It's not on the map, so I don't know if this pristine spot has a name. We spotted a school of small fish (minnows?) sunning themselves at the shoreline. 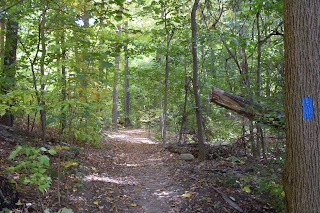 The trail continued largely unmarked along a pair of fields, following the edge of the woods. The sun caught us hard from the west, much stronger than usual for an October afternoon. As we ascended Thayer Hill the views opened up to the north and east, and we could see for miles across the landscape. 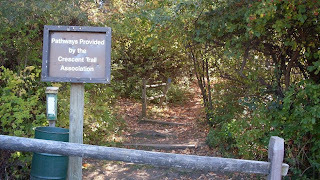 Our path was wide enough at that point for horseback riders, and flanked by tall grasses and rusty-red wild bushes. We laughed at the thought of finding Laura and Pa Ingalls walking here; it sure looked like a scene from Little House on the Prairie. At the summit we found no shade at all, a bench improvised from an old set of wooden steps, and one more laminated copy of the map we had forgotten. 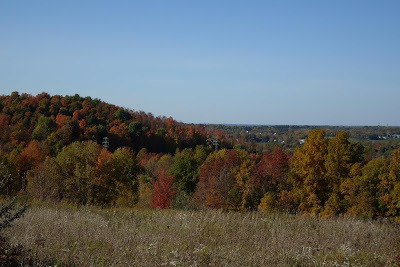 Though the fall colors were mostly subdued, the air was crystal clear.In the distance, to the northeast, we could make out no less than four big water towers. Housing developments nestled in the valleys looked like scale models from a train layout. Tired and feeling the effects of the sun, we finished the last of our water, ate our honey and oat bars, and followed the prairie path back to the woods, thankful to find shade again. We took a detour along the red-blaze section this time and found more of the tiny creekbed, thoughtfully bridged with planks. The trip back to the trailhead was almost entirely downhill, which was wonderful. At the bottom we found our car waiting for us, a little hotter from sitting in the sun, but a welcome sight for our tired feet. We headed home, happy to have enjoyed a walk in the sun on a perfect Indian Summer day. If you have a hike you'd like to share, leave a Comment here that links back to you, or Contact me using the link at the top of this page. 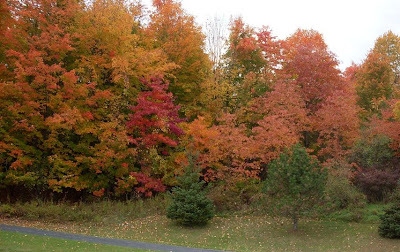 October mornings in Western NY can be chilly, even dismal. This photograph was taken in early October at seven am, just before the sun cleared the horizon. I was headed to work, rather than waking up early in my camper; but savoring a sunrise like this one is exactly why it's worth getting up early. This photograph is offered for public domain - feel free to save it and use it! 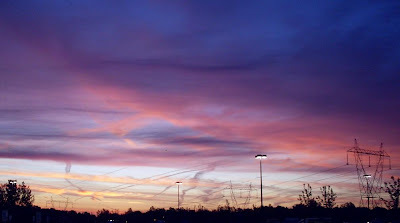 Do you have an amazing sunrise or sunset photo you'd like to share? Leave a comment and link right here, so we can have a look. Or Contact me to submit your pic for publication. In British Colombia you will find four KOA campgrounds which each offer something a little different. They are all located in the southern region. The northernmost KOA you will find in fact is in Clearwater. What follows is a brief overview of their operations, amenities, and the extras you can expect to find at each. The southernmost KOA campground you will find is the Victoria West KOA, which is just off the U.S. border near Vancouver. It opens for business on May 15th and closes on September 15th, which makes for a rather short operating schedule. The campground offers tent sites, one and two room cabins, RV slots with 50 amp service, a swimming pool which operates from June first to September second, and free WiFi service. This is a forested mountain setting campground riddled with fir and cedar trees. Hiking trails to views of the Strait of Juan De Fuca are available, as well as a host of local stops so you don't have to miss high tea. Whale watching and fishing excursions can be arranged through this KOA. 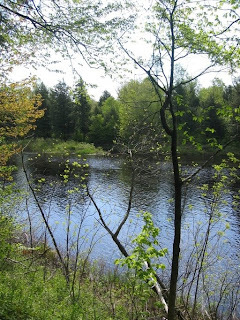 It is a charming, quiet campground which is well suited for families with little ones. The Sicamous KOA offers tent sites, RV slots (100-foot length) with 50 amp service. One and two room cabins are also available (book well in advance). The season of operation here runs from May 1st to October 1st, with the swimming pool opening from May 23rd through September 5th. 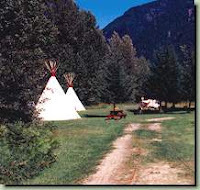 The campground is just off Trans-Canada Highway 1, only a few minutes from Shuswap and Mara lakes. 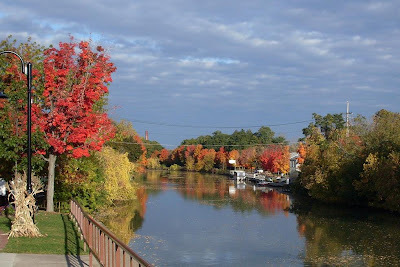 This is a great KOA for water lovers as there are plenty of activities centered on the lakes. They also offer regular campground activities like pancake breakfasts and ice cream socials. Fireworks and nature walks are also a part of the package at this a very popular KOA. 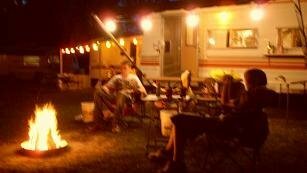 The Revelstoke KOA operates between May 1st and October 15th and offers accommodations similar to Sicamous. RV sites are 120-foot length, and teepee rental sites are available for something different. The heated pool is open from June 1st until September 4th. Here you will find a beautiful mountain backdrop that wonderfully offsets the two playgrounds. This is a bit of a luxury KOA in that, in addition to the now standard KOA offering of WiFi service, cable television is also available. You'll also be treated to a duck pond and a meeting hall on site. Mt. Revelstoke and Glacier National Park are the biggest draws in this area and well worth the time to explore. Golfing, whitewater rafting, hiking, fishing, and ATV tours are all available in the area, as well all the local amenities. The Clearwater/Wells Gray KOA opens for operation on May 1st and closes down on October 12th. RV slots with 50 amp service and 100-foot length are available, as well as tent sites and one-room cabins. The pool opens on May 19th and closes on September 9th. 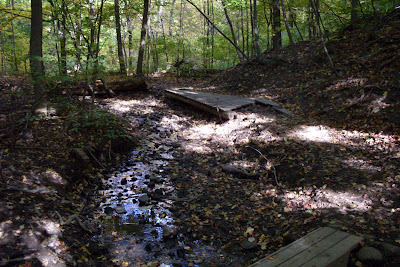 This is known as the waterfall park. Wells Gray Provincial park has over 250 cascades, featuring Helmcken Falls. Hiking at the park is also available. Nearby you can canoe, mountain bike, river raft, kayak, or take a more relaxing lake cruise. The pool is heated. Sand volleyball, mini-golf, and a selection of other games are also available. This site won the 2007 KOA President's Award! No matter which KOA you choose you can't go wrong. There's plenty to do at each, and with affordable rates it won't break the bank to stay at any of them. Remember to book in advance whenever possible for cabins, and that kids 5 and under stay free. The only thing that stands in the way of you and a good time at these great sites is you. The four KOA's of British Columbia offer everything you need to have a great camping experience. Reprinted by permission from Amanda Fox. How about you? Do you have a campground review you'd like to share? These will be a regular feature here as we move forward. If you'd like to submit your review for posting, you can reach me via Comments or by using the link at the top of this page. 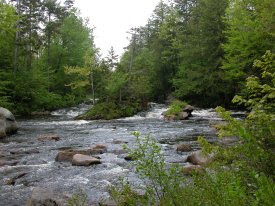 My first real camping trip was a guided journey to the wilderness area surrounding the Oswegatchie River. Earning my freshman college Phys-Ed credits by taking a vacation sounded like a sweet deal to me. All I had to do was spend a couple days camping out to fulfill the PE requirement for my first semester. What a fine adventure! This was the tail end of the seventies, and most of us smoked. We probably smoked all the way up there, riding inside those vans. (Can you imagine the air quality?) Only one of us thought to bring enough cigarettes to last the entire weekend, but that's getting ahead of the story. Before we returned to the campus we'd learn all about underestimating our provisions. It was early October. Fall in New York can be gorgeous, or it can be miserable, and sometimes both. We had plenty of sun in the forecast, but a shortage of warmth. Pretty typical. Our camping guides, a trio of weather-hardened outdoorsmen with teaching credentials, assured us we'd be warm enough on the first leg of our sojourn. They were right about that. After endless miles on I-81 we finally arrived at the only usable public entry point to the river. A rustic but heavenly general store marked our last sight of civilization. Some of us bought candy and soft drinks; others grabbed an extra pack of Marlboro's. At this point we were still getting acquainted, laughing and joking and sneaking glances at the lone female of the pack. Next our caravan followed a one-lane "road" deep into the forest. We could have jogged alongside the vans, given the highest speed the lane allowed. I doubt we traveled more than ten miles, but it felt like fifty. Eventually the mighty Oswegatchie appeared at the edge of a clearing. There was just enough room to park the vehicles and unload all those canoes. We dragged the little boats and our half-ton of gear to the water's edge and pushed off on the first leg of our big adventure. Maybe we appreciated the splendor of that winding river mountain preserve on a crisp fall day. I doubt it, though; we were all pretty busy rowing like galley slaves. Our nervous chatter, marked by occasional laughter, echoed in the trees that surrounded us as we paddled deeper and deeper into the big woods. The Oswegatchie slithers and winds in a seemingly endless series of oxbows. Sometimes those of us leading could see the tail end of our canoe train through the screen of trees and brush. All of us wondered if we'd make it to camp before dark. We weren't the least bit cold, not yet. Eventually, after ten or twenty hours of hard labor (a slight exaggeration), we reached a clearing by the river. We staggered to shore, dragging our watercraft and assessing our accommodations. We had lean-to's! Some hard-working men, left unemployed by the ravages of The Great Depression, had built us a couple of solid dirt-floored shelters. Our professors had brought a tent for the grown-ups. We probably had hot dogs for dinner. That memory eludes me completely. Did we make the girl do the cooking? I hope not. We did find out, once we were a thousand miles from home, that her boyfriend was along for the trip. So much for whatever romantic ideas the rest of us had. We finished the last of our hoarded snacks before the sundown, too. It was going to be a long weekend. By now I'm sure you realize that once the sun had set the temperature began to plummet. We were mostly small-city kids; what did we know about cold in the mountains? The usual cure for sudden chill involves sharing body heat. That wasn't going to work. We slept in our flannel shirts and jeans, shivering with our cheap sleeping bags pulled up over our heads. The heat from the evening's campfire didn't reach our open-fronted shelters at all. The beautiful fall sun returned in the morning, of course. Our uncontrollable shivering subsided once we'd ingested some breakfast. Too bad all the life-giving chocolate bars were gone. As soon as the dishes were done (the girl? No, we all pitched in, didn't we? ), our tour guides led us on a fifty mile hike in the hills. (Close enough.) That warmed us up. We all knew it would get dark again sooner or later, though. It's funny, but I don't remember much of anything after that. Perhaps we hiked far enough to exhaust us all by nightfall, so that we could sleep blissfully unaware of the numbing cold. The only other detail I can recall is that the one guy who'd been smart enough to bring a whole carton of Marlboro's was treated like a minor deity. I'm also sure that all that smoking didn't help our hypothermia one bit. We must have reversed our river journey and returned to the launching point sometime on Sunday morning. I remember the sound of the little bell on the door to the general store. Maybe I was asleep until we walked back into the rousing aroma of beef jerky, Hershey bars, and burnt coffee. I'll bet we dropped a couple hundred dollars in that store before we got back into the vans for the long drive home. I'm pretty sure we had the time of our lives.